Paleocene vegetation is best known from the Rocky Mountains and Great Plains of North America, northeastern Asia, and Greenland. Isolated Paleocene sites have been discovered or described in Europe, the Canadian Arctic, Antarctica, New Zealand, India, Colombia, Chile, and Argentina. Africa and Australia are poorly known, with essentially no Paleocene megafloras. The North American Paleocene is so well sampled from nearly a thousand fossil localities that knowledge of Paleocene megafloras is probably an order of magnitude greater than that of Maastrichtian megafloras from the same regions. Probably the only benefit of this great data disparity is that the dense sampling of the Paleocene relative to the Cretaceous provides a situation where survivors of the K-T boundary event are likely to be well sampled and K-T boundary last-appearance data are likely to be reliable. 126 dicotyledonous angiosperms, 13 monocotyledonous angiosperms, 13 ferns, 7 conifers, 6 bryophytes, 1 Gingko, 1 cycad, 1 Equisetum, and 1 lycopod. He established that the Paleocene flora included the first occurrence of many extant angiosperm genera in the Salicaceae (Salix), Juglandaceae (Carya, Juglans, Pterocarya), Betulaceae (Betula, Corylus), Fagaceae (Castanea, Quercus), Ulmaceae (Celtis, Ulmus), Lauraceae (Sassafras), Sapindaceae (Acer), and Cornaceae (Cornus, Nyssa). Other genera that he identified to extant genera are almost certainly different elements that bear a superficial resemblance to extant taxa. These misattributions include Moraceae (Artocarpus, Ficus, Morus), Rosaceae (Prunus), Aquifoliaceae (Hex), and Vitaceae (Ampelopsis, Cissus, Parthenocissus, Vitis). Brown focused much of his energy on the K-T boundary and as a result he was very interested in the stratigraphic distribution of plant species. Nonetheless, Brown's summary did not treat this issue as anything more than a general matter, and the precise stratigraphic range of Paleocene species had to wait for subsequent researchers including Peter Crane, Leo Hickey, Kirk Johnson, Steven Manchester, Elisabeth Mclver, Peter Wilf, Scott Wing, and Jack Wolfe, who greatly increased the number of known Paleocene megafloral localities. The geographic and temporal density of Paleocene megafloral sites in these rocks provide the opportunity to assess the regional vegetation over a ten-million-year period both in terms of latitude and with respect to local sedimen-tological facies and position within depositional basins. Collectively, the Paleocene megaflora of the Rocky Mountains is an impressive record of nearly a thousand localities spanning a contiguous region of more than a million square kilometers. It is arguably the largest and most continuous fossil floral sequence of any age. The portion of this sequence exposed in the Powder River Basin of Wyoming contains some of the world's thickest coal seams and the largest coal reserves in North America. The abundance of Paleocene plant sites presented an opportunity for isolated organs from the same plant species to be associated, based on multiple co-occurrences. Steve Manchester from the University of Florida has aggressively pursued this approach and he and his colleagues have successfully reconstructed several plants based on this methodology (e.g., Manchester et al. 1999). Based on this work, it is clear that the Paleocene contained an abundance of Cornaceae, Juglandaceae, Cercidiphyllaceae, Betulaceae, Ulmaceae, and Hippocastanaceae. These families are represented by both extant and extinct genera. Figure 5.5 Artist's reconstruction of early Paleocene vegetation based on paleo-botanical data from the excavation for the Denver International Airport. Painting by Donna Braginetz, copyright DMNS; reprinted by permission. Clarks Fork Basin, a northern extension of the Bighorn Basin in Wyoming, based on more than 10 000 specimens from 66 localities distributed through the Fort Union Formation, which is up to 3000 m thick. The Clarks Fork Basin and the adjacent Bighorn Basin is the only region in the Western Interior where all four of the Paleocene land mammal stages (Puercan, Torrejonian, Tiffanian, Clarkforkian) are known in superposition. Hickey's localities were tied to mammal localities and thus represented the first complete sequence of Paleocene floras. He recognized 74 species that he used to define four mega-floral zones. The lowest zone roughly corresponds to the Puercan land mammal stage, radiometrically dated as the first million years of the Paleocene (Swisher etal. 1993). FUI megaflora is presented in Table 5.1. It is important to note that many FUI megafloral taxa occur over a paleogeographic range exceeding 10 degrees of latitude. Despite more than a century of intensive sampling of the Paleocene Rocky Mountain floras and a broad understanding of their composition, the 1994 discovery of a hyperdiverse, 64-million-year-old tropical rainforest megaflora from the western margin of the Denver Basin in Colorado (Johnson and Ellis 2002) suggested that the Paleocene megafloral record, however extensive, was still incomplete (Figure 5.6). Compositionally similar but an order of magnitude more diverse than other Paleocene floras, the Castle Rock site presented a conundrum that remains unresolved today. This is discussed in Section 7.3. 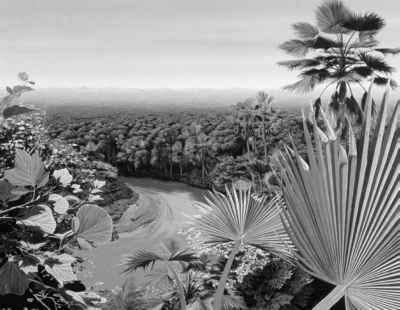 Figure 5.6 Artist's reconstruction of the 63.8 Ma tropical rainforest vegetation based on paleobotanical data from the upper part of the Denver Formation in Castle Rock, Colorado. Painting by Jan Vriesen. Copyright DMNS; reprinted by permission. In the Paleocene, the palynofloristic provinces that had existed in the latest Cretaceous were significantly altered. Most dramatically, the Aquilapollenites Province in western North America ceased to exist (Tschudy 1984). In western North America, up to 45% of the Maastrichtian palynoflora - primarily angio-sperm pollen - disappeared from the region (Nichols 1990, Nichols and Fleming 1990, Nichols et al. 1990). All but one of the uppermost Maastrichtian species of the genus Aquilapollenites vanished abruptly at the K-T boundary. The lone surviving species, Aquilapollenites reticulatus (also known as A. mtchedlishvilii), is present in the lowermost Paleocene as well as in the upper Maastrichtian, but it disappeared in the middle Paleocene. In well-studied sections in the Williston Basin of North Dakota and Montana, about 30% of the palynoflora including species of Aquilapollenites and many others became extinct within a few centimeters of the K-T boundary (Hotton 2002, Nichols and Johnson 2002), and an additional 20-30% underwent a statistically significant decline in abundance (Hotton 2002). Early Paleocene megafloras from northeastern Asia are represented by significant localities on both the Russian and Chinese sides of the Amur River (Krassilov 1976, Kodrul 2004) and the Koryak Uplands (Golovneva 1994a, b). These floras contain a great number of genera in common with Paleocene localities in the Western Interior of North America. Some of these taxa (e.g., Celtis aspera, "Ampelopsis" acerifolia, Beringiaphyllum cupanioides) are not known from the Cretaceous on either continent, suggesting a continuity of connection across the Bering Land Bridge into the early Paleocene. Unlike the Paleocene megafloras from the central part of North America, the Russian and Chinese Paleocene megafloras have not been independently dated and the temporal ranges of specific taxa are poorly known. In the Siberian region, palynofloristic changes from the Maastrichtian to the Paleocene were profound. Bratseva (1969) summarized data that indicate that in Danian (Paleocene) time, taxa that had been subordinate in the Maastrichtian became widespread, and ancestral members ofthe modern families Myricaceae, Betulaceae, and Juglandaceae became dominant. In western North America, lower Paleocene palynofloras are severely reduced in diversity in comparison with those of the Maastrichtian (Hotton 2002, Nichols and Johnson 2002). In these assemblages, a few species tend to dominate numerically. Low diversity in lower Paleocene palynomorph assemblages is also reported in the Neotropics of the Western Hemisphere (Jaramillo et al. 2006). 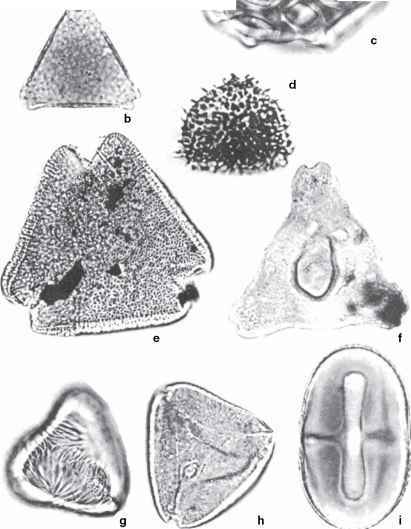 The most extreme examples of low-diversity palynologic assemblages in the lowermost Paleocene constitute the fern-spore spike at the impactite-level of stratigraphic resolution (see Section 2.3); these assemblages, which are discussed in the next section, may consist almost entirely of a single species of fern spore. At the stage level of resolution, palynofloras from the lower Paleocene are characterized more by the absence of Maastrichtian species than by the presence of new Paleocene taxa, which appeared gradually later (Nichols and Johnson 2002, Nichols 2003). Based on palynologic evidence, the family Juglandaceae, which has a negligible record in the Maastrichtian, radiated through Paleocene time, and its many species now serve as the basis of palynostratigraphic subdivision of the stage (Nichols 2003). These and many other new species that characterize Paleocene assemblages tend to have close affinity with living taxa. In contrast to the Aquilapollenites Province in western North America, the Normapolles Province of the Late Cretaceous persisted through the Paleogene in eastern North America, Europe, and western Asia, although waning in numbers of taxa (Batten 1981). The late Paleogene decline and eventual disappearance of the Normapolles group of pollen that defines the palynofloristic province seems to be a result of the gradual evolution of the pollen-producing plants into modern taxa of the order Juglandales (Traverse 1988b). A contributing factor to the dissolution of the province may have been the Paleocene withdrawal of the epicontinental seaways from North America and Asia, seaways that had effectively separated the Normapolles and Aquilapollenites provinces in Cretaceous time (Batten 1981). This resulted in geographic mixing of evolving taxa in plant communities and biomes across the Northern Hemisphere. Southern Hemisphere Paleocene megafloras are known primarily from the South Island of New Zealand, the Antarctic Peninsula, and southern Patagonia. Sampling is meager and stratigraphic relations are still too poorly known for us to understand how these floras differ from Upper Cretaceous floras from the same regions. In general, early Paleocene floras grew in a warm greenhouse world that was forested from pole to pole. 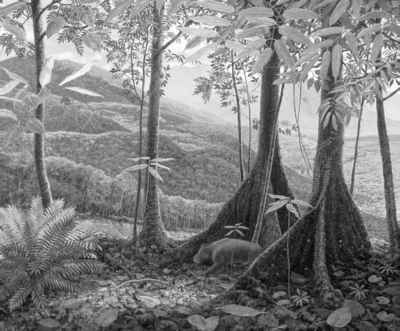 Paleocene forests contained the earliest examples of many extant genera. As with the Maastrichtian, very little is known of Paleocene floras from the equatorial regions, and despite the presence of early Paleocene tropical rainforests at mid latitudes, there is little to no evidence for them at low latitudes.